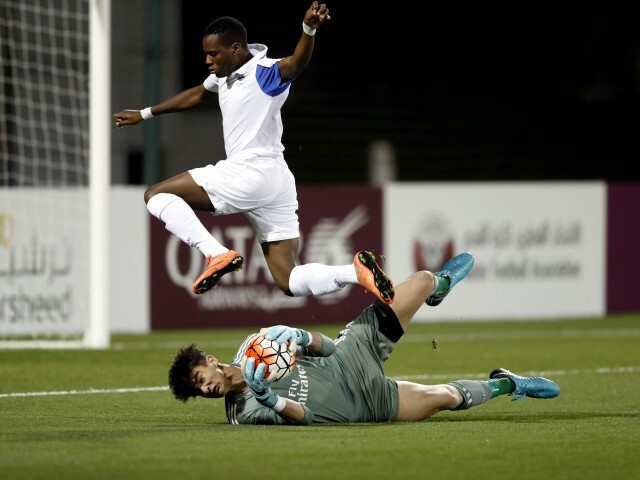 Aspire Football Dreams ran out deserving 3-1 winners against Real Madrid in an engrossing clash between two of the strongest squads at Al Kass 2018. The teams had met earlier in the tournament, sharing the spoils in a 1-1 group game. Both sides were unlucky to have had their progress curtailed at the quarter-final stage, with Football Dreams going out on penalties to PSG, and Real falling victim to the now-familiar smash-and-grab tactics of Kashiwa Reysol. All in all, it meant that there was little left to play for but pride in this encounter. So it was a credit to all concerned that this game quickly developed into a highly competitive affair. Initially, there was little to choose between the teams, but Aspire were soon in the ascendancy, and took a deserved lead on 25 minutes. Real’s Julio Escorcia was somewhat casual in attempting to play the ball out from the back, and was charged down by Salim Diaby inside the area. The attack-minded midfielder then squared for Christian Otabil to convert the simplest of chances. Escorcia was again at fault on the half hour when he slipped and, in trying to recover possession, hacked down Sibiry Keita as he advanced into the area. The referee awarded a penalty, but Keita’s kick was too close to keeper Toni Ribera, who made a routine save to keep the score at 1-0. Aspire kept the pressure up, but Real almost grabbed an equaliser against the run of play on 42 minutes. Striker Cristian Garcia latched onto a cross on the edge of the six-yard area, but he wafted the ball over the bar under pressure from AFD keeper Appiah Kubi. Madrid upped the tempo as the second half got underway, belatedly asking questions of the AFD backline. And, on 55 minutes, Juan Latasa struck an equaliser when his fierce cross-shot squirmed under Kubi’s body and crept over the line. The Spanish striker had looked marginally offside as he latched on to the through ball, but the goal stood. There was no controversy about AFD’s second, however, which arrived ten minutes later. Aspire’s forwards worked the ball across the edge of Real’s area from right to left, and Isaac Nuhu arrived late to stroke a splendid first-time curler into the far corner from 18 yards. With 20 minutes remaining, Madrid coach Manuel Fernandez sacrificed midfielder Jorge Camunas for right-sided forward Alex Mendoza as Los Blancos sought a way back into the game. Aspire held firm in the face of intense waves of pressure, and added a third with five minutes remaining, when Umar Lutalo rose highest – and unchallenged – to head home a corner from the left. Outfought at every turn, Real’s frustration now boiled over, and Javier Lancho was shown a straight red card – the first of the tournament – after a crude two-footed challenge on Djakaria Barro. Ultimately, Football Dreams ran out worthy winners, securing fifth place at Al Kass 2018 in a match that would have made for a great final. Indeed, it says much about the professionalism of both sides that they approached this fixture with complete focus and determination, despite there being little at stake.